A daunting domain to those lurking on the fringes, wine can divide as much as it (a few glasses later) unites. And, until Noble Rot Magazine, contemporary wine lore was often missing what it so often stirs up among its drinkers—fun. Now with its own wine bar and restaurant in London, the good slosh continues. 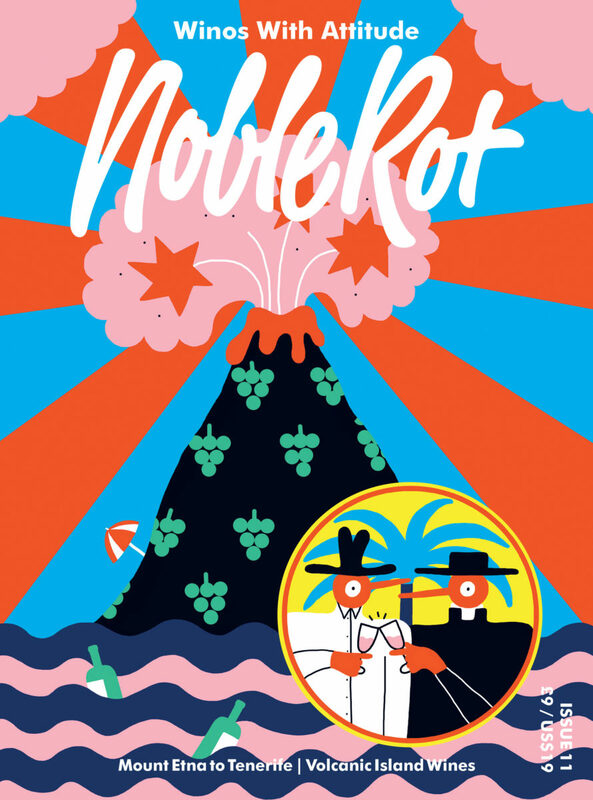 Friends by way of a wine tasting, in 2013 Dan and Mark launched Noble Rot, named for the fungus that shrivels and sweeten grapes, to “de-twattify” the wine world. 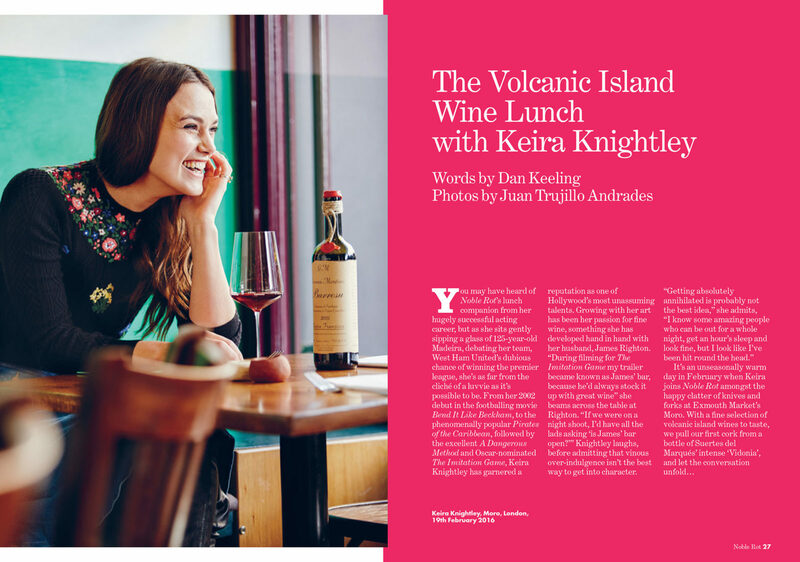 The content inside speaks to drinkers of all backgrounds: you’ll find an informative introduction to Beaujolais back to back with a nostalgic ode to Retsina-fueled Grecian nights, or a visit to a centuries old family vineyard. Familiar faces make frequent appearances, often during candid boozy lunchtimes—the Beastie Boys’ Mike D, Yotam Ottolenghi, David Shrigley, or Caitlin Moran. 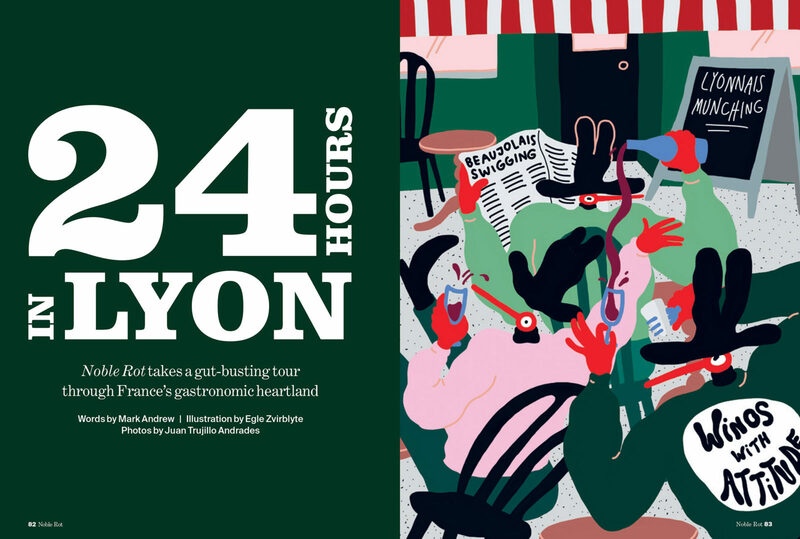 By creating a space that is as erudite as it is witty and serving up wine with hearty sides of life, they have arguably pulled-off for the wine world what Lucky Peach has done for gastronomy. “We strive for accomplished, well-informed writing with a sense of humor… Noble Rot is light-hearted but never lightweight. 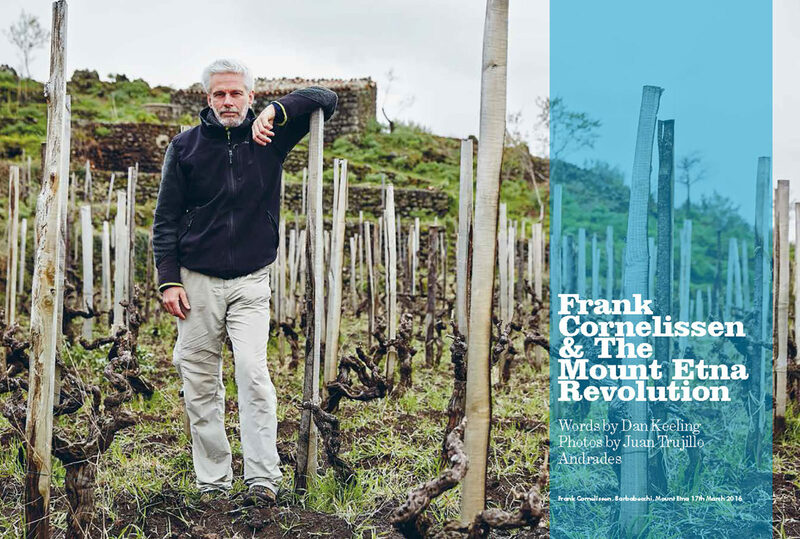 A balance between wine, food and creative arts coverage is also important for us—most wine magazines write about wine as if it exists in a vacuum,” explains Dan. 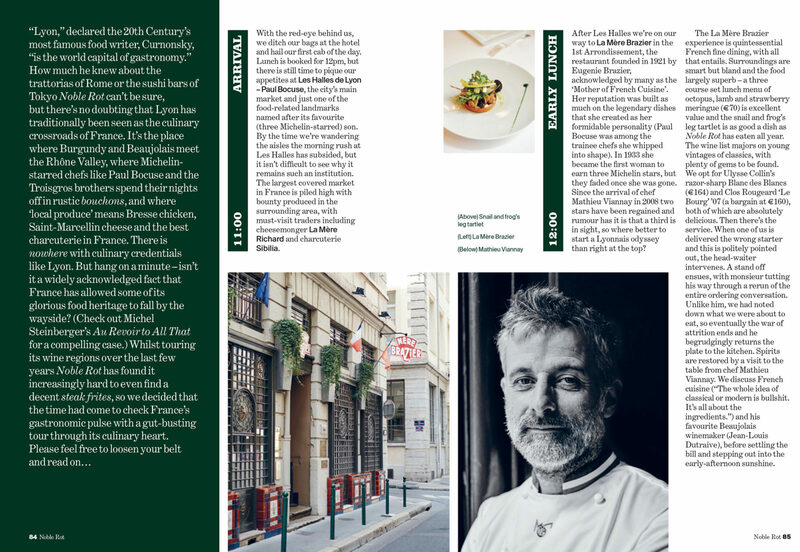 As of late 2015, the award-winning Noble Rot wine bar and restaurant have brought the contagious high spirits of the magazine into the physical world—to critical acclaim. Seated inside, we chat to Mark and Dan about vinous appreciation and are treated to a recipe by Noble Rot ‘s Head Chef, Paul Weaver. 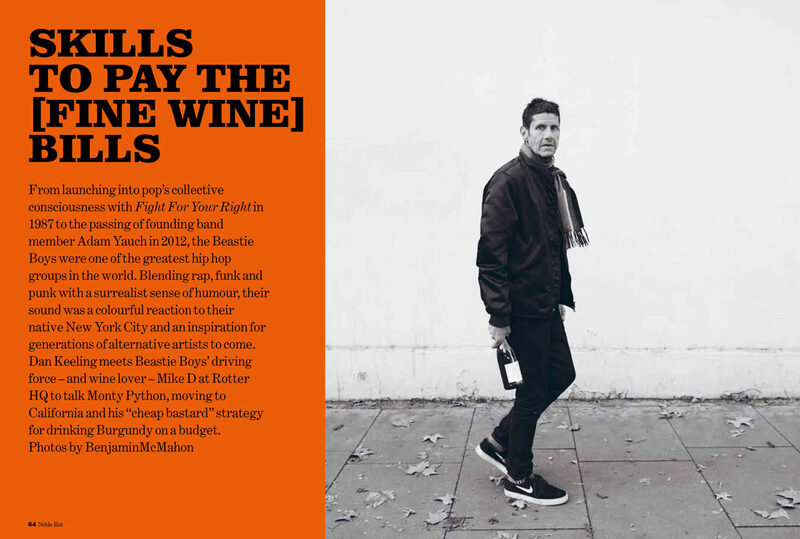 You very memorably launched Noble Rot as a publication that would “de-twattify” wine. How does this mission translate into what happens here on the Noble Rot premises? D: We’ve got a doorman called Bruno who refuses entry to anyone wearing red trousers or mumbling about PH levels. Tell us about the interaction between the menu and wine list at the restaurant. D: We love to play with both classic and unorthodox wine matches. Restaurant favorites include Vin Jaune with Comté tart and Turbot braised in oxidised Bâtard-Montrachet, whilst in a recent Noble Rot feature we enjoyed drinking sweet Château d’Yquem with sushi. M: We strive to serve dishes that are wine friendly as this gives our front of house team lots of scope to be creative and recommend interesting wine matches from our list. Beyond your pages, where have you seen evidence of the changing face of wine appreciation? D: Good wine is being produced in more places than ever before, and drinkers have better access and information about it too. We love to see people embracing wine culture without fear or pretentiousness, which is happening more and more. M: There’s been a shift towards younger people becoming more engaged with wine. We see it in our bar and restaurant, but also at the other places we drink and tastings we go to. It’s great to see and evidence that there is still enormous potential to get more people drinking the good stuff. What movements in the wine world of late have excited you most? D: The explosion in great artisanal wines around the world, everywhere from Champagne to Tenerife and Mount Etna. M: The drive towards the ‘authentic’ has brought so many interesting, unique wines to the world’s attention. More and more producers are now striving to make wines that reflect the place that they come from, using traditional techniques and obscure indigenous varieties, rather than worrying about whether they have got a swanky winery and a marketing plan in place. In the process, the world has also rediscovered a treasure trove of classics that fell out of favor for many years, and realized that ‘fine wine’ doesn’t begin and end with the accepted classical regions. You tend to frame an issue around a wine or region. 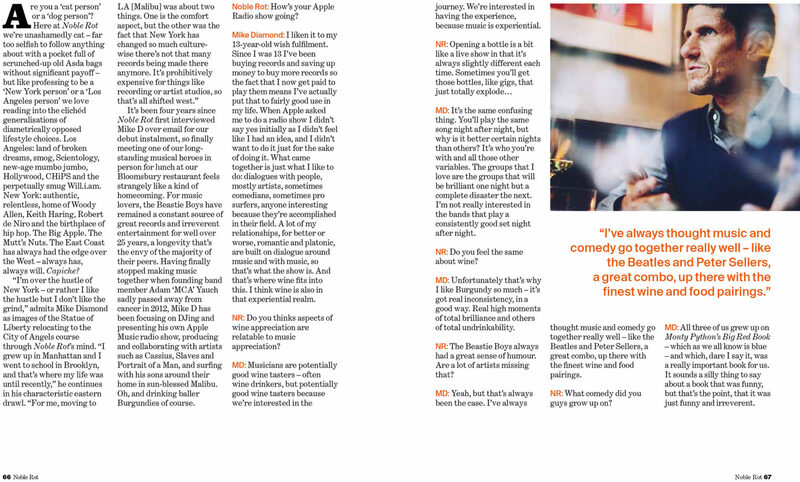 Tell us a little about issue 12, why Beaujolais? D: Beaujolais Cru has been making great strides in quality and it’s a classic region where drinkers can still buy the best wines for less than £35—we can’t say that about many other fine wines. M: It’s also one of the most hospitable wine regions you are likely to find. We’re hoping that our coverage might encourage more people to investigate further and maybe even pay the region a visit. D: Start by investigating grapes, then regions, then producers. It’s a bit like music—once you discover Iggy Pop it leads to David Bowie to Kraftwerk to Africa Bambaataa…Everything is connected! M: Where you buy your wine is also so important. Plucking anonymous bottles off supermarket shelves is never going to improve your drinking, so find a really good local independent merchant (there are lots of them). Buying your wine from someone who really cares and knows about it will make a massive difference. Cheers, Mark and Dan for the Noble Rot intro. For more information see the Noble Rot website, and follow both the wine bar and restaurant and magazine on Instagram. See more of our culinary adventures on FvF here.